Belgian linen draperies are the gold standard for window treatments both ready-made and custom. In a Florida beach house with spectacular views, drapery panels appear to be lined but retain the lovely, slouchy quality for which Belgian linen draperies are beloved [top]. When drawn over the windows, the curtains create a soft textured fabric wall. When open, they break generously on the floor and stack back over the blank wall areas between the windows which helps emphasize the water views from the house. Made from Pom Pom at Home linen, the draperies are hung from a track that’s essentially invisible because it’s recessed ceiling beam and the window wall. Soft curtains add a romantic aura to a hard-edge room like this one and their fullness at the bottom — which hat allows them to stand away from the fall like an old-fashioned ball gown — is thoroughly luxurious. Longtime clients of the great Belgian designer and antiquaire Axel Vervoordt acquired an 18th century apartment in a Roman palace. When the maestro went to work on the space, he oversaw the restoration of the original coffered ceilings , especially in one of the bedrooms. 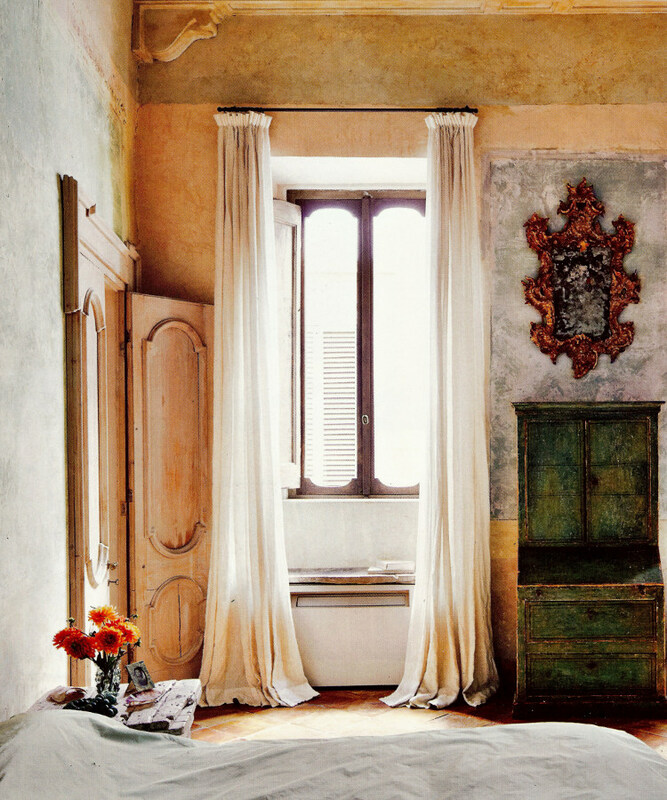 There, beneath centuries of paint, amazing Baroque-era painted walls were discovered and brought back to life. With so much emphasis on the wall surfaces, windows needed a soft touch. Naturally, Vervoordt turned to unlined Belgian linen — his signature fabric — for demure curtains hung from a slim wrought-iron curtain rod just below a painted panel. With, short pleated tops and visible hems that fold on the floor, the draperies required enough fullness to gracefully frame the narrow old window and partially conceal a heating unit tucked below the window seat. 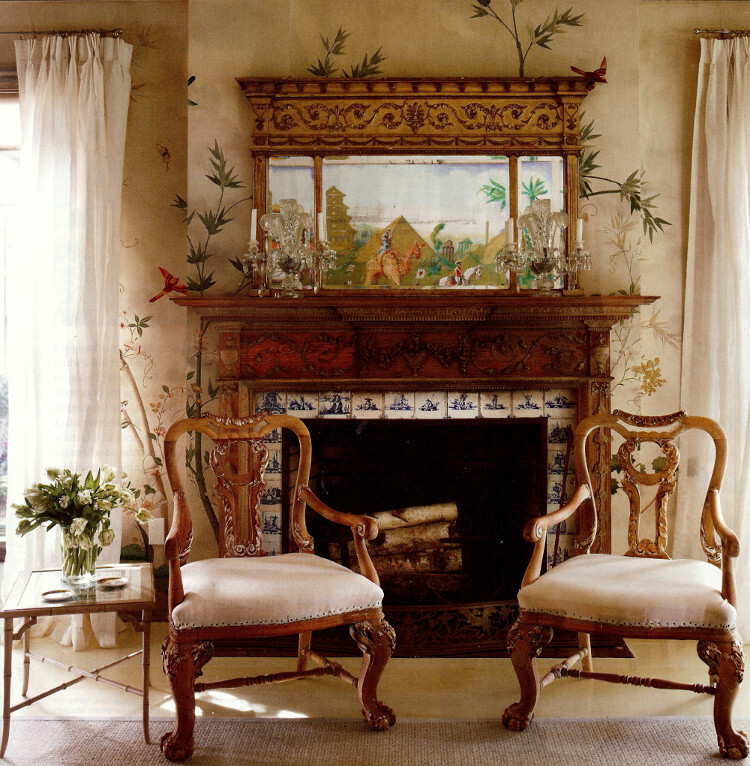 In a Southhampton, New York living room with an elaborate Adam-style fireplace and traditional hand- painted Asian-style wallpaper, curtains are a bit beside the point. 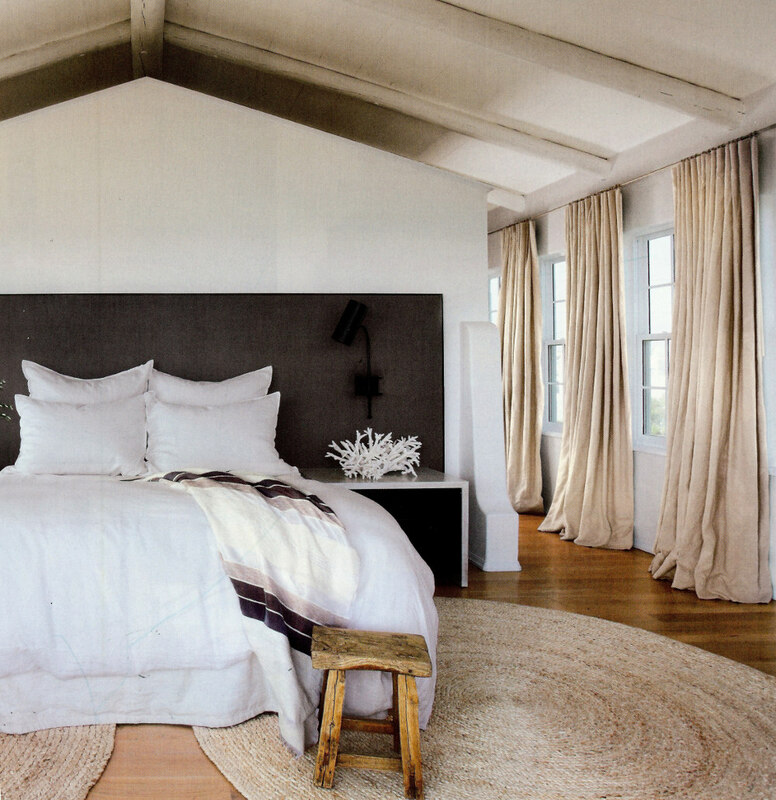 Decorator Rain Phillips also chose unlined Belgian linen for draperies with pinch-pleated tops and sewn hems. Less full than others we’ve seen, these draperies hang closer to the wall. The choice of linen could be considered a more modern pick than silk, which at one time might have been dictated by the wallpaper. But they hook up nicely with the deconstructed look of the muslin covered seats on the antique armchairs and help keep a staunchly traditional room from looking staid.